Turbo Pascal is a dialect of the Pascal programming language which was sold by Borland International during the 1980s and 1990s for use with the MS-DOS and later Microsoft Windows operating systems. A few versions (1.0 and 1.1) were also released for Apple's System 6 and System 7 (a.k.a. Mac OS in later versions).It provided an Integrated Development Environment or IDE, which combined editor, program compiler and execution environment for developing, debugging, and compiling Pascal source code. It would later provide features such as conditional compilation and the ability to separately compile modules using the unit directive, and would also implement some of the features which were first implemented years earlier in UCSD Pascal. Beginning with version 5.5 Turbo Pascal introduced support for OOP by an extended version of the Object Pascal syntax that had been introduced with Apple's Mac Pascal. 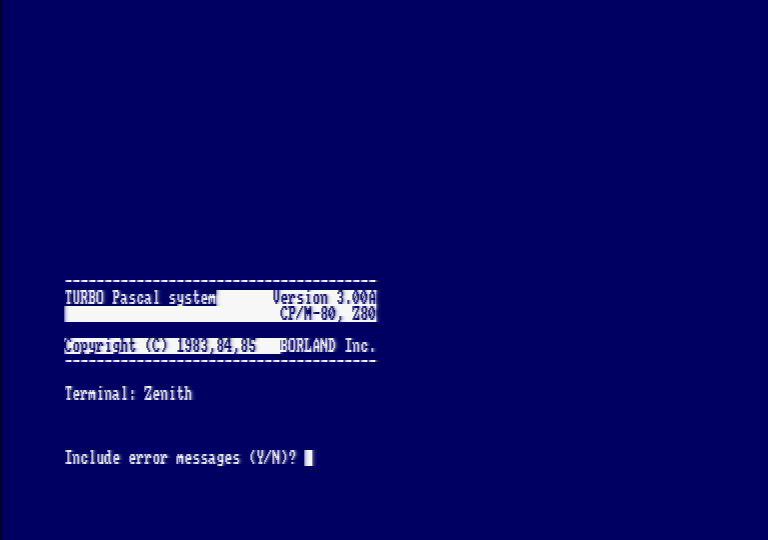 Turbo Pascal would eventually be renamed Borland Pascal, and later phased out, to be replaced by a more powerful Pascal Compiler, Delphi, for use on the Microsoft Windows (and the Kylix version for use on the Linux) operating system. The FPC Pascal Compiler provides a high level of compatibility with code written for Turbo Pascal and Borland Pascal, and some degree of compatibility with code written for Delphi and Kylix. An extensive list of compilers is maintained at Pascaland. This page was last modified on 27 January 2019, at 08:37. This page has been accessed 16,102 times.